iCloud has its roots in Lala, a start-up company that Apple bought. Lala allowed users to play music they already owned from the Web. iCloud will run out of a recently completed $1 billion, 500,000-square-foot data center in North Carolina that is nearly five times the size of Apple’s data center in Newark, N.J. The company has been gearing up for a sharp increase in data-storage and hosting needs as it moves the users into the cloud. Apple has signed deals with Warner Music Group, Sony, Sony Music Entertainment and EMI Group and Universal Music Group. The agreements will let Apple, for $25 per month, offer an easy way for consumers to create and listen online to their entire MP3 music collections, without the time-consuming work of manually transferring or uploading songs. Many in the music industry see such offerings as a key next step in the evolution of digital media, in which music, and eventually video, is convenient and ubiquitous. Terms of the deals between Apple and the record labels would allow Apple to offer a “scan and match” locker service. Unlike services offered by Google and Amazon, which require users to upload their music libraries, Apple’s new service is about ease of use (but only in the Apple ecosystem…right now Blackberry and Windows devices not recognized). The agent would analyze the library stored on a computer and grant access to songs it recognizes without requiring an upload. Users then are able to listen to their music on compatible smartphones and computers, without copying the songs into each device’s memory. Google and Amazon.com have attempted to create similar “scan and match” services but so far haven’t been able to agree on license terms with the various record labels. Apple with their agreements would further increase its stickiness with its users, making it more difficult for Google and Amazon to lure them away. The battle is now shifting to content AND device. Apple will charge users $25 a year for online access to thousands of songs in their personal libraries. Apple will split the $25 annual fee with record companies and music publishers, keeping 30% for itself and giving the other 70% to the music companies. 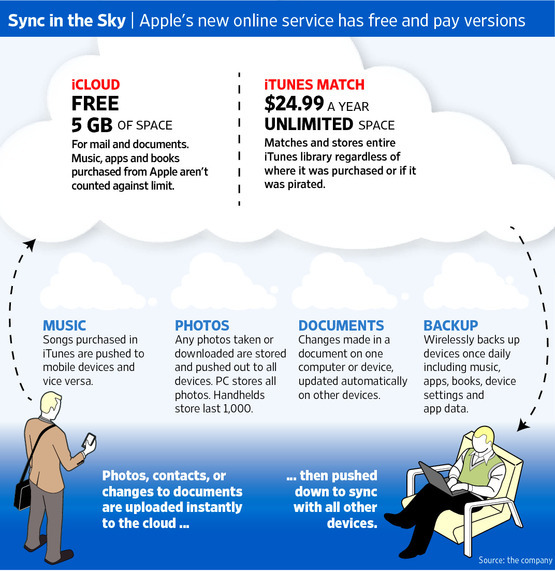 With iCloud, it is unclear whether Apple, plans to replace an existing offering called MobileMe. That Web-based service lets users store data in a central location and synchronize calendars and contacts among computers and other devices. MobileMe costs $99 a year. Apple is also making available its iWork productivity suite, which includes its word processing, presentation and spreadsheet software, for the iPhone and iPod touch. Previously the software was only available for its computers and iPad. 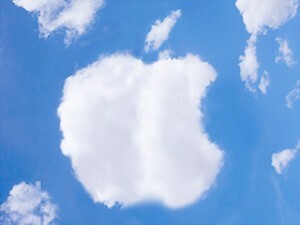 The move would let users more easily centralize their documents and access them from any device when iCloud goes live. So let’s do some basic math. If 10M users adopt this service at $300 per year that is $3 Bln in spend. Apple keeps 30%, so $900M in additional revenue. Interesting. If they get 5% of their current base adopting this in 6 months, we are looking at more than a billion $ in new revenue. That’s pretty good for a new product launch. On the other hand if the data is in the cloud, there’s no need for the consumer to spend money for a bigger hard drive. That’s $100 saved on a 16GB versus 32GB iPhone (or a $164 difference between an 8GB and 64GB iPod touch. Much higher for iPads) So we might see a trend towards cheaper phones or iPads if the iCloud works as advertised. 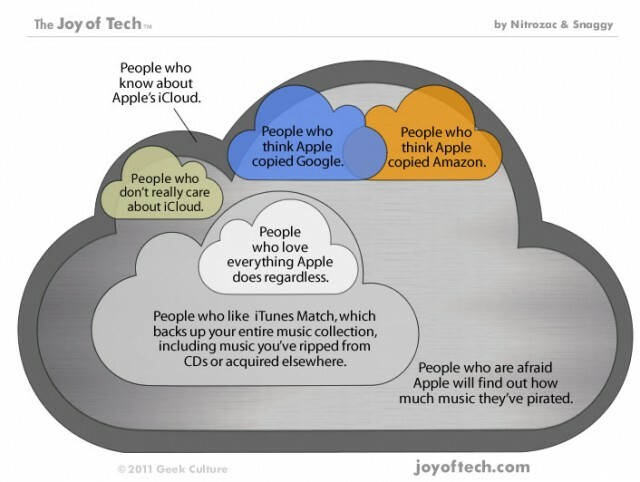 So Why is iCloud a Big Deal? Apple is systematically developing public data cloud services while incumbents, including IBM, Hewlett-Packard, Cisco Systems, Oracle, are focused on the private cloud. The adoption of private cloud (really data-center consolidation controlled by the enterprise customer) is terrific in the short-term for the incumbents as they sell new servers, storage and software to clients struggling to embrace virtualization. Who can blame those companies for not being in a hurry to expand into lower-margin public cloud services, when their existing high-margin businesses have been so good for so long? The big firms are going to protect their profit margins as long as they can. As long as the traditional vendors can continue to sell gear and software into their largest customers, they will resist the transition to offering Web-based computer services. Unfortunately this is a trap. Simply look at Microsoft. The confused/diffused cloud and online strategy and lack of a clear corporate direction despite having some really brilliant engineers is like watching RCA all over again. Or look at Cisco with their consumer strategy around Flip video, Nokia and other market leaders. The problem for the incumbents is that they are not geared for the shifting world. The incumbents have duct-taped their existing technology to work in a mobile/social/web-based world. That fix will work for only so long. Apple, if it continues to execute, will start pulling away from competitors even faster. Apple is executing an ecosystem strategy better than anyone else. iCloud will become an integral extension of Apple’s next-generation operating systems: Lion, the eighth release of Mac OS X for desktops and laptops; and iOS 5, which will power the iPhone, iPad and iPod. Apple’s strategy also undercuts the strategy of telcos like AT&T and Verizon which were planning to offer cloud based storage services to drive additional revenue. Once Apple gets the kinks out, I don’t see why the iCloud can’t be extended to serve other mobile device platforms like Nokia, Blackberry and Win 7 platforms. The big value is for growing millions of iPads users as the iCloud solves a big problem. They don’t have to invest in additional drives or cards. I won’t be surprised if Apple announces a social media offering next. They have all the ingredients in place to mount a full-frontal attack on Facebook and others. They have sticky customers, sticky mobile devices, app store, record label and movie distribution relationships, sticky cloud offerings and even have 200+M credit cards (authenticated identities). They have the entire supply chain in place to be a fierce competitor to Facebook. The race is on…personal cloud and personal “big data” management is becoming the new frontier in consumer data management.